2 securities of other companies if you learn something in the course of your employment or relationship with us that might affect their value. For instance, if you learned that we were about to acquire ABC Corporation prior to a public announcement, it would almost certainly be an insider trading violation for you to buy or sell ABC securities as well as our securities. If you learned something about XYZ Corporation which was not publicly known while you were working for us on collaboration with XYZ, buying or selling XYZ securities might well be considered illegal, even if the information learned was not related to the collaboration. 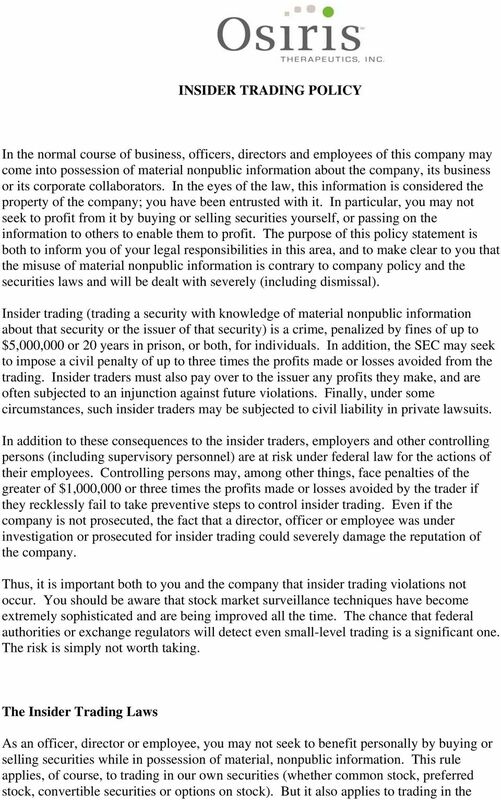 The insider trading rules apply both to purchases of securities (to make a profit based on good news) and sales of securities (to avoid a loss based on bad news). Sometimes material nonpublic information about the company or another company with which we are working comes to your attention even though you are not directly involved in the project. 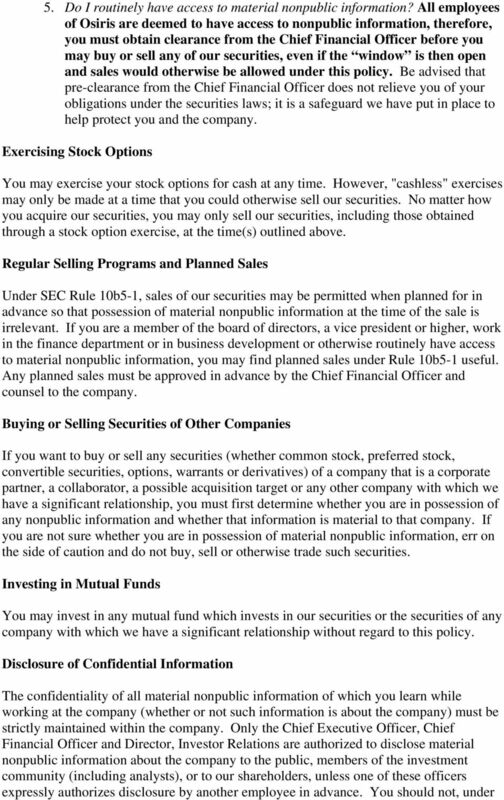 You are nonetheless prohibited from buying or selling our securities or the securities of such other company. 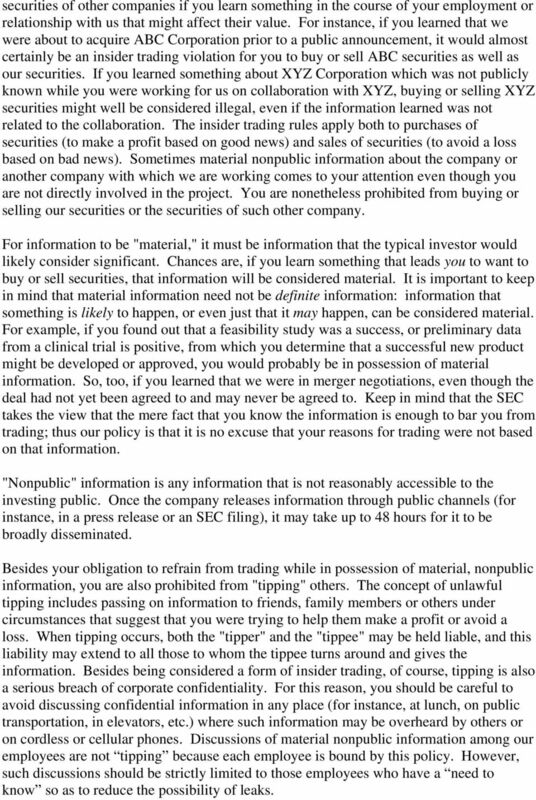 For information to be "material," it must be information that the typical investor would likely consider significant. Chances are, if you learn something that leads you to want to buy or sell securities, that information will be considered material. It is important to keep in mind that material information need not be definite information: information that something is likely to happen, or even just that it may happen, can be considered material. For example, if you found out that a feasibility study was a success, or preliminary data from a clinical trial is positive, from which you determine that a successful new product might be developed or approved, you would probably be in possession of material information. So, too, if you learned that we were in merger negotiations, even though the deal had not yet been agreed to and may never be agreed to. Keep in mind that the SEC takes the view that the mere fact that you know the information is enough to bar you from trading; thus our policy is that it is no excuse that your reasons for trading were not based on that information. "Nonpublic" information is any information that is not reasonably accessible to the investing public. Once the company releases information through public channels (for instance, in a press release or an SEC filing), it may take up to 48 hours for it to be broadly disseminated. Besides your obligation to refrain from trading while in possession of material, nonpublic information, you are also prohibited from "tipping" others. The concept of unlawful tipping includes passing on information to friends, family members or others under circumstances that suggest that you were trying to help them make a profit or avoid a loss. When tipping occurs, both the "tipper" and the "tippee" may be held liable, and this liability may extend to all those to whom the tippee turns around and gives the information. Besides being considered a form of insider trading, of course, tipping is also a serious breach of corporate confidentiality. For this reason, you should be careful to avoid discussing confidential information in any place (for instance, at lunch, on public transportation, in elevators, etc.) where such information may be overheard by others or on cordless or cellular phones. Discussions of material nonpublic information among our employees are not tipping because each employee is bound by this policy. However, such discussions should be strictly limited to those employees who have a need to know so as to reduce the possibility of leaks. 3 Policy Because insider trading creates such a risk of liability to both you and the company, it is contrary to company policy to engage in any activity that would be considered unlawful trading or tipping under the securities laws with information gained as a result of your employment or relationship with us, whether in our own company s securities or the securities of another company. This policy extends to your immediate family members and anyone living in your home. Persons violating this policy will be subject to disciplinary action, which may include immediate dismissal from the company. It is also company policy that any investing that you do in company securities or the securities of any company that has a significant relationship with us be on a "buy and hold" basis. Active trading, short-term speculation, hedging, margin purchases and short sales are discouraged and any such transaction must be pre-cleared with the Chief Financial Officer. Buying and Selling Company Securities If you want to buy or sell any of our securities (whether common stock, preferred stock, corporate notes or options on stock), you must first ask yourself the following questions: 1. Am I in possession of material, nonpublic information? If so, you may not buy or sell or otherwise trade any of our securities, no matter what position you hold with the company. If you are not sure as to the answer to this question, err on the side of caution and do not buy, sell or trade. 2. 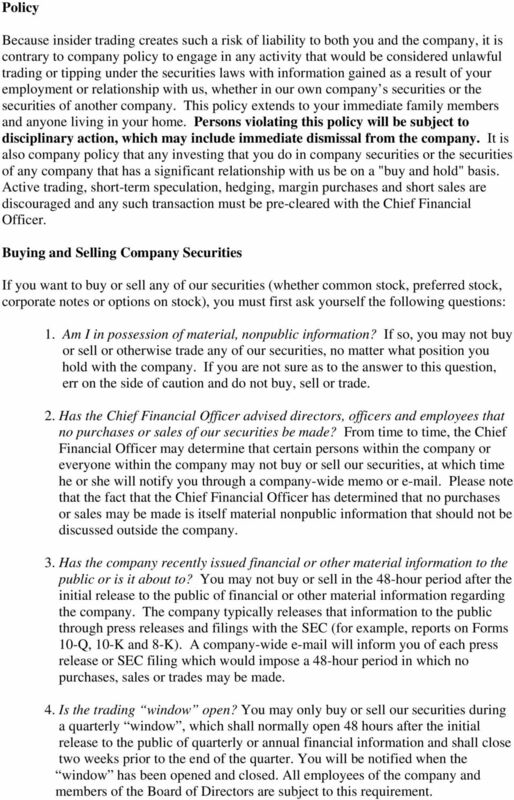 Has the Chief Financial Officer advised directors, officers and employees that no purchases or sales of our securities be made? From time to time, the Chief Financial Officer may determine that certain persons within the company or everyone within the company may not buy or sell our securities, at which time he or she will notify you through a company-wide memo or . Please note that the fact that the Chief Financial Officer has determined that no purchases or sales may be made is itself material nonpublic information that should not be discussed outside the company. 3. Has the company recently issued financial or other material information to the public or is it about to? You may not buy or sell in the 48-hour period after the initial release to the public of financial or other material information regarding the company. The company typically releases that information to the public through press releases and filings with the SEC (for example, reports on Forms 10-Q, 10-K and 8-K). A company-wide will inform you of each press release or SEC filing which would impose a 48-hour period in which no purchases, sales or trades may be made. 4. Is the trading window open? You may only buy or sell our securities during a quarterly window, which shall normally open 48 hours after the initial release to the public of quarterly or annual financial information and shall close two weeks prior to the end of the quarter. You will be notified when the window has been opened and closed. All employees of the company and members of the Board of Directors are subject to this requirement. 5 any circumstances, recommend or express opinions as to our securities or comment on rumors or predictions about the company, regardless of whether the rumor is false and whether you think your recommendation, opinion or comment is being made on an anonymous basis (for example, in a website chat room). If you are ever asked a direct question about the company or any prevailing rumor about the company, respond that it is company policy not to comment on such matters and that any questions should be directed to the Director, Investor Relations or the Chief Financial Officer. BERKSHIRE HATHAWAY INC. To: From: Re: The Directors, Executive Officers and Key Employees of Berkshire Hathaway Inc. and the Executive Officers and Key Employees of its Subsidiaries Warren E. Buffett "Insider"
Share Trading Policy SHARE TRADING POLICY Trading in securities of Amcor Limited 1. Overview and Definitions This statement sets out the policy of Amcor Limited ( Amcor ) for trading in Securities of Amcor.